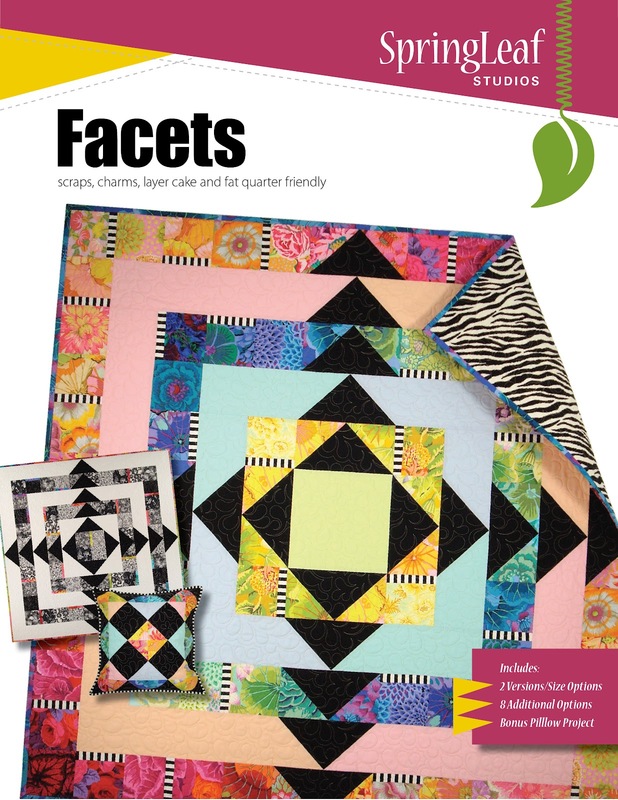 Just a quick note that Pattern Spot is running a sale on all quilts in the Scrappy category. 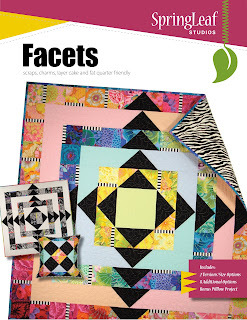 This includes my Facets pattern. 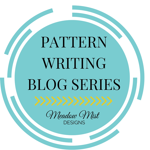 If you don't know about Pattern Spot it's an online pattern shop developed by C&T Publishing to sell downloadable sewing and quilting patterns. Shoppers have instant 24-hour online access to browsing and buying patterns from a wide variety of designers, project types and styles. Hop over with this link and use coupon code SCRAP10 (all caps no spaces) to receive 10% off your purchase of my pattern or any other in the Scrappy category now through June 5th. I'll be back soon with some fresh new blog posts. Trip to Portland (not for Market), a new Modern Quilt Guild, Generation Q magazine giveaway plus other quilty things. Till then enjoy the summer. It's that time of year again. Time for the Blogger's Quilt Festival sponsored by Amy's Creative Side. For those of us who don't get to attend Quilt Market, this is such a wonderful way to see all the amazing quilting going on out there. 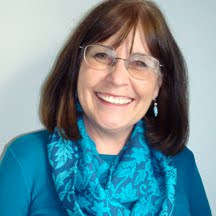 Be sure to hop over to Amy's site and browse through all the linkys. I had the hardest time deciding what to enter. Lots of things are in the works but not many finished projects. Looking back over this past year I realized one of my favorites was the quilt I made from a layer cake of Moda's Tradewinds fabric line. A very summery quilt that I'm looking forward to using again this summer. I had never used a precut bundle of fabric before but this line just spoke to me. Fresh, eclectic, a touch of the exotic. I just love the little tea cups. 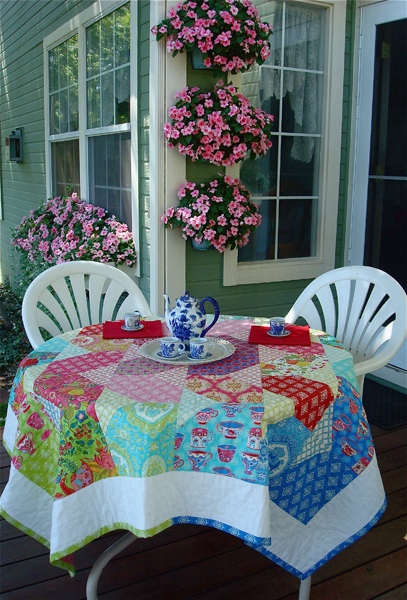 Makes the perfect print for a backyard garden tea party. I bought more tea cup fabric to make napkins. Just need to sew them up. 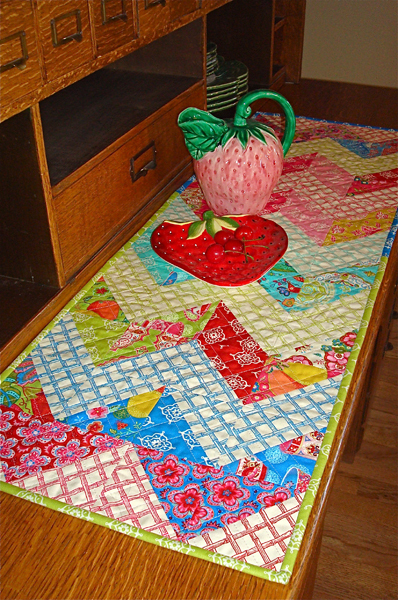 I used my Cascade pattern for the quilt and made a table runner with the leftovers. The pattern tells you how to use your scraps as you piece the top so the extra blocks are done at the same time. Love the runner just as much as the quilt itself. 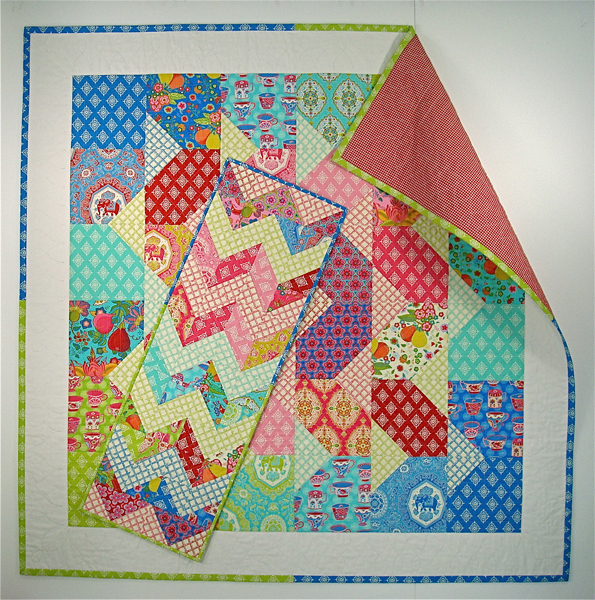 Very scrappy, yet coordinates well with the quilt. And it looks perfect with my strawberry dishes don't you think? Designed, made and quilted by me. Just a heads up about a pattern sale going on over at PatternSpot. 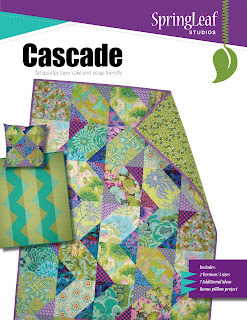 You can take 10% off all Modern Quilt Patterns now through May 22nd, 2013. Cascade and Facets are in this category so it's a great time to go ahead and give them a try. I'm also quite curious as to which type of pattern you prefer; pdf downloadable or traditional printed paper pattern? Leave me a comment letting me know your preference.